Though it seemed Melissa Benoist was not yet back full-time when “Parasite Lost” was filmed, Supergirl managed to incorporate Kara’s side story much more effectively this week than last. While Alex (Chyler Leigh) navigated her leadership of the DEO with the added influence of Colonel Haley’s supervision and J’onn (David Harewood) took on another case on his way to becoming a private detective for National City’s alien community, Kara realized that she could champion justice through journalism even when she couldn’t don her superhero suit. It seemed that Alex’s new partnership with presidential liaison Haley was going much more smoothly than expected, given that the Colonel complimented her and Brainy (Jesse Rath) on their efficiency instead of barking orders as expected. Perhaps buoyed by this apparent faith, Alex operated with much more confidence than last week and took down the Parasite-infected Agent Jensen with ease – even talking him into surrendering instead of shooting him like she was supposed to. In fact, Parasite 2.0 ironically ended up being one of the more disappointing parts of “Paradise Lost,” serving only to set up the camaraderie and conflict between both ladies at the DEO. In the end, the thawing tension between them quickly froze back up when Haley inadvertently revealed her anti-alien sentiments with a few jabs at J’onn. J’onn, meanwhile, discovered his new calling in life over the course of his investigation into an attack on an alien healer named Amadei. After Kara wrote a glowing profile on the man in the hopes on humanizing the aliens in National City, the man was severely injured and online hate seemed to be the culprit. 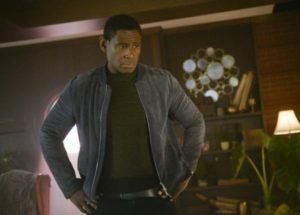 Supergirl showed off both both characters’ strengths here, allowing J’onn to use his telepathy and observational skills uncover the family drama that secretly ensnared Amadei in order to restore his health and taking the more emotional approach with Kara by focusing on her hope for change. While the revenge by an estranged ex-lover angle felt like it was straight out of a 90s soap opera, “Parasite Lost” provided the launching pad for Kara and J’onn’s next steps in terms of professional and personal growth. Aliens looking to J’onn as their own personal police force because they can’t trust the prejudiced law enforcement rang all too true, and Kara pitching a series of alien living their very human lives felt like exactly the answer that “Man of Steel” two weeks ago demanded. You can’t meet racists in the middle. Kara and J’onn weren’t the only characters doing the investigative legwork this week, though. 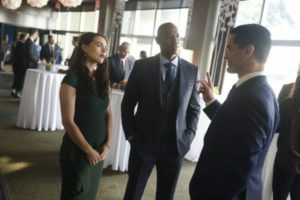 James (Mehcad Brooks) and Lena (Katie McGrath) were confronted with racism as the new centrist perspective when they went to a luncheon for the mainstream media and were met with not only Ben Lockwood (Sam Witwer) but several journalists who agreed with him. Once again, Lena was put in the awkward position of espousing the naive “no one listens to extremists” position, which was at odds with her experience growing up with the Luthors. Nevertheless, it was important for Supergirl to show the insidious power of so-called fringe groups and it made sense to educate the audience through a fan-favorite like Lena. Plus, the confrontation with Ben gave James the idea for yet another exciting storyline prospect: undercover reporting. By the hour’s end, James had set the stage to infiltrate the Children of Liberty using his position as the human hero Guardian to win their approval. The only disappointing part of this plot is that the audience knows he’s already talking to the very leader he’s trying to reach, but hopefully that will lead to some delicious irony in the future. Finally, while they only had one scene together, Nia (Nicole Maines) and Brainy once again stole the show with their sweet and innocent chemistry. While getting sloppy drunk at a rooftop party, Brainy ran into Nia once more in front of all their mutual friends. She pointed out that he never found her, and he proceeded to prove how good he was at stalking before uttering the line of the night: “You told me to find you, not call you!” Supergirl can take this ship anywhere after it leaves the dock, because I’m already onboard. While “Parasite Lost” wasn’t as memorable as previous episodes this season, it certainly set the stage for some great arcs, which fans can watch unfold when Supergirl airs Sundays at 8/7c on the CW.